In late 1937, Clinton G. Abbott, Director of the San Diego Natural History Museum, received a letter from an acquaintance who had heard rumors about sea lions (Zalophus californianus) being killed off the Mexican coast for their use in dog and cat food. Horrified by the prospect of such highly intelligent animals being killed, Abbott would soon embark on a two year journey to protect Mexico and California’s marine mammals. This is the story of Abbott's and the San Diego Natural History Museum's ultimately successful efforts to stem the slaughter. While sea lions had been legally protected in some form or another in California since 1909, Mexico had yet to follow suit. Taking advantage of this fact, the Dr. W. J. Ross Dog and Cat Food Company of Los Alamitos employed three ships (one, the Romancia, was previously the private yacht of King Alfonso of Spain) to sail into Mexican waters and set anchor near one of the many sea lion rookeries on the islands off the western Mexican coast. Men would then go ashore and scare the animals into the water where waiting nets would scoop them up for slaughter on the boats. In this way, the Ross Company would kill over 150 sea lions a day, a number comparable to other sea lion hunters in the area. Unlike the other hunters, though, the Ross Company sent the sea lion meat back to California, breaking state law protecting the mammal. This quickly caught the eye of many conservationists in San Diego, including many in the San Diego Society of Natural History. First notified by T. N. Faulconer, the former director of the San Diego Zoo, in late November or early December of 1937, Clinton Abbott quickly picked up the torch. Worried about people's perception that he was a "mere museumist" approaching the issue with more sentimentality than business acumen, the director enlisted the help of numerous outside agencies. Communicating with the California Department of Fish and Game, the American Society of Mammalogists, and the Mexican government, Abbott soon fleshed out an approach to end the Ross Company's operation. Worried most about the ethical implications of killing such intelligent mammals, as well as the disruption of local ecosystems, Abbott would routinely use the humane aspect of his argument to first appeal to anyone with an open ear. Another troubling issue he highlighted was the probable killing of the northern elephant seal (Mirounga angustirostris), at that time one of the world’s most endangered marine mammal species. Reduced to a sole rookery on Guadalupe Island, the seals had numbered as few as eight individuals in the early 1890s. Given formal protection by the Mexican government in 1922, the seals had seen their numbers slowly rise in the time since. The proximity between Ross’ suspected hunting grounds and the few elephant seals left in this hemisphere gave Abbott added ammunition when dealing with Mexican authorities. Making pointed references to Ross employees bragging about "cleaning up a lot of elephant seals" and the "excellent protection" given the seals by the Mexican government, Abbott would routinely use the suspected slaughter of elephant seals to give weight to his own argument against the known slaughter of California sea lions. Bolstered by his compatriots' support, and infuriated by the Mexican government's renewal of the Ross Company's concession late in 1938, Abbott wrote an article on the sea lion slaughter for Bird-Lore, the journal of the Audubon Society at the time. The article was met with a positive reception throughout the United States and Mexico, and reprinted numerous times. 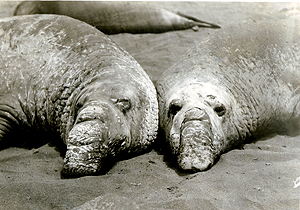 While the article was the highlight of the conservancy effort for Clinton Abbott, as he withdrew himself from the struggle shortly after the article appeared, the protection of sea lions and elephant seals continued to be a hot button issue throughout the 1940s. The legacy of the conservation effort to protect California sea lions, marine mammals, and the Pacific coastline lives on today in the United States in the 1972 Marine Mammal Protection Act. The San Diego Natural History Museum continues to be a leader in these efforts, as highlighted in the film Ocean Oasis and the Binational Multidisciplinary Expedition to Guadalupe Island. The majority of the reference material for this article is drawn from Box 186 in the San Diego Natural History Museum’s research library’s archives. This box includes correspondence from Clinton G. Abbott, the Californian and Mexican governments, and Abbott’s contacts, numerous newspaper clippings from the time concerning the issue of “Sea Lion Slaughter,” as well as rough drafts of the resulting article. As another postscript, the Ross Company was left reeling by Abbott and other conservancy efforts to stop their hunting. Already in receivership in 1937 after their whaling rights were revoked, Abbott’s campaign put a further dent into their profits. By 1944, they declared bankruptcy. Abbott, Clinton G. 1939. “Sea Lion Slaughter.” Bird-Lore Vol. 41. (September, October), pp. 264-270. Bonnell, Michael L. and Robert K. Selander. 1974. “Elephant Seals: Genetic Variation and Near Extinction.” Science, New Series, Vol. 184, No. 4139. (May), pp. 908-909. Condor, The. 1934. “Notes and News.” Vol 36. (July), pp. 181-182. Crawford, Charles F. 1938. “Food For Canines: Ross Vessels Kill Sea Mammals, Donkeys, Sheep for Dogs.” Long Beach Press-Telegram, Nov. 21. Engstrand, Iris and Anne Bullard. 1999. Inspired By Nature: The San Diego Natural History Museum After 125 Years. San Diego: San Diego Natural History Museum. Fiscus, Clifford H. and Gary A. Baines. 1966. “Food and Feeding Behavior of Steller and California Sea Lions.” Journal of Mammalogy, Vol. 47, No. 2. (May), pp. 195-200. Huey, Laurence M. 1930. “Past and Present Status of the Northern Elephant Seal with a Note on the Guadalupe Fur Seal.” Journal of Mammalogy, Vol. 11, No. 2. (May), pp. 188-194. King, Judith E. 1964. Seals of the World. London: Trustees of the British Museum. MacMullen, Gerald F. 1926. “Four Guadalupe Island Seals Captured for San Diego Zoo.” The Evening Tribune, June 25, Afternoon Edition. Odell, Daniel Keith. 1972. “Studies on the biology of the California sea lion and the northern elephant seal on San Nicolas Island, California.” Ph.D. Dissertation, University of California, Los Angeles. Prentice V. Boteler et al., 141 F.2nd 175, (9th Cir., 1944). Reeves, Randall R., Brent S. Stewart, and Stephen Leatherwood. 1992. The Sierra Club Handbook of Seals and Sirenians. San Francisco: Sierra Club Books. San Diego Journal. 1946. “Hot Argument Waxes Over California Coast’s Sea Lions.” April 4. San Diego Natural History Museum Bulletin, February 1, 1938. San Diego Natural History Museum Bulletin, April 1, 1938. San Diego Natural History Museum Bulletin, June 1, 1938. San Diego Sun. 1926. “Save Eagles, Museum Urges.” Nov. 17, Afternoon edition. San Diego Sun. 1926. “War Is Opened Against Lions.” Dec. 6, Afternoon edition. San Diego Sun. 1937. “Is That You, Alfonso? Well, Dewey’s Gone to the Dogs With Your Yacht.” Dec. 16, Morning Edition. San Diego Sun. 1937. “‘Killer’ Ship Obtains Seal Meat For Pets.” Dec. 17. San Diego Sun. 1943. “Fine Arts Gallery and Two Park Museums To Be Closed.” March 8. San Diego Union. 1928. “Protectors of Feathered Friends In Convention here, Make Pleas to Save Birds from Ruthless Killing.” May 6. Scheffer, Victor B. 1958. Seals, Sea Lions, and Walruses. Stanford, Ca: Stanford University Press. Von Bloeker, Jack C.. 1993. “Historical Perspectives: Who Were Harry R. Painton, A. Brazier Howell, and Frances F. Roberts.” The Condor Vol. 95, pp. 1061-1063. Zavala-González, Alfredo and Erik Mellink. 2000. “Historical Exploitation of the California Sea Lion, Zalophus californianus in México.” Marine Fisheries Review Vol. 62, N. 1, pp. 35-40. All photographs used, unless otherwise noted, have been taken from the San Diego Natural History Museum’s website. Scanning was done at 600 ppi and the images saved as TIFFs for storage and JPEGs for Web use.